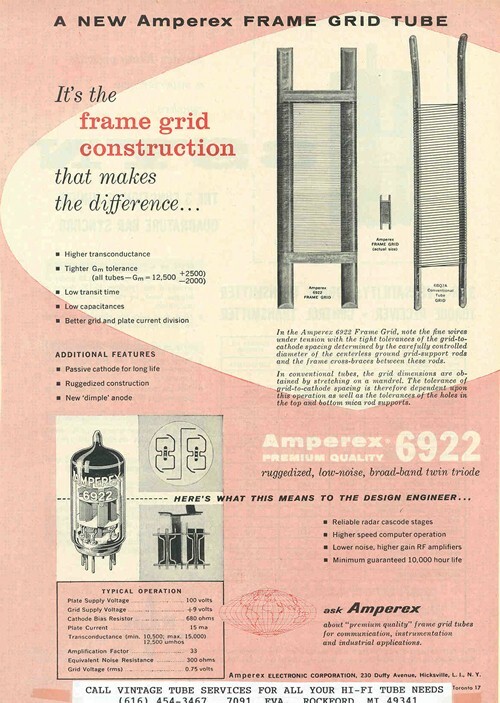 Located at 79 Washington Street in Brooklyn, New York, Amperex was a long established manufacturer of transmitting tubes when they were acquired by the giant Dutch firm, Philips in 1955 or so. 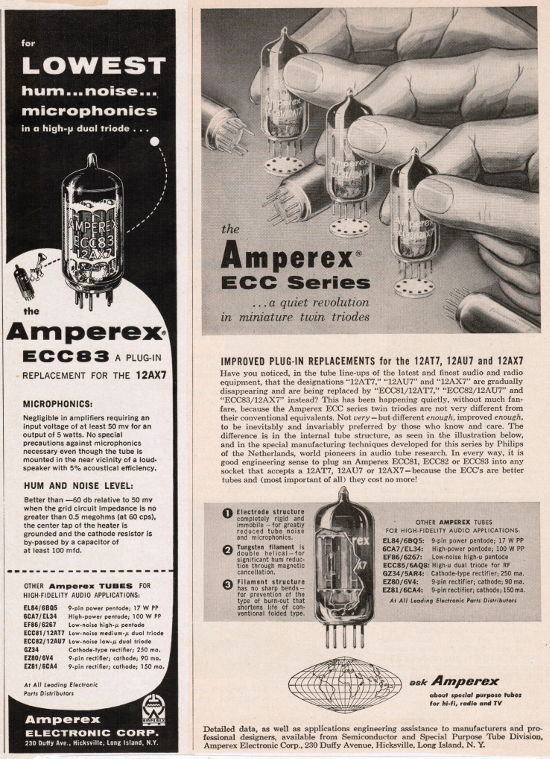 Philips continued to improve and enlarge the transmitting plant in New York, but also used the Amperex name to distribute their fine new line of Dutch made minis, (12AX7, 12AU7, 12AT7) to feed the booming U.S. Hi-Fi market. 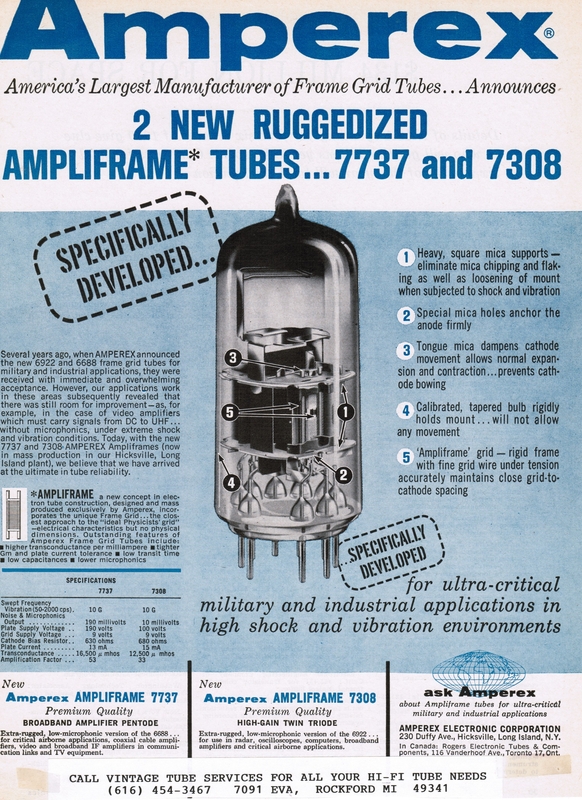 These sweet & airy, but still full and solid sounding tubes have been the favorite of music lovers for 45 years! Classic Hi-fi brands such as Marantz, Fisher, Scott, etc… owe a large part of their great sound to these tubes. In the line up of the three sisters, the three European sisters that is, the Amperex is like the fair-haired Dutch blond. The Telefunken is the tall, well built, sandy haired blond in the family, and the Mullard is the ravishing black haired, British brunette. These are of course just slight “hues” in the perspective that these tubes present, as they are really all extremely transparent units. 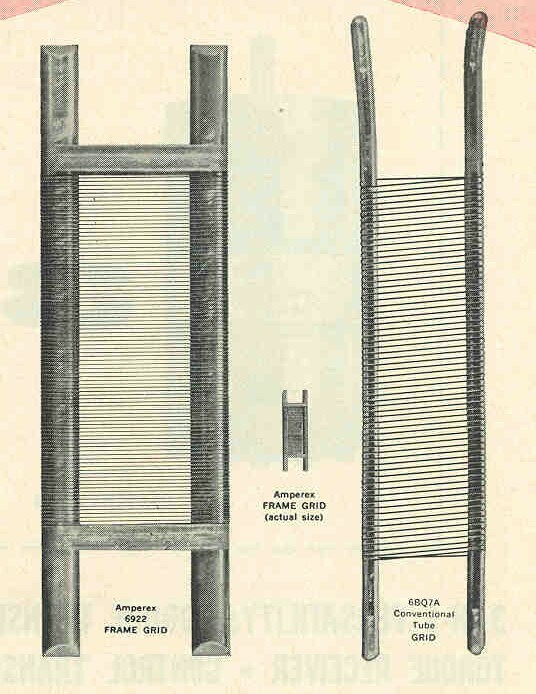 And of course we can’t forget the 6DJ8, 6922 & 7308 frame grid tubes. Developed by Amperex in 1958 when transistors were already starting to take over the electronics industry & originally developed for video & radar use, the 6DJ8 has come into heavy use in audio over the last 15 years. And Amperex definitely made some great ones like the Original “Bugle Boy” series with it’s seemingly, magical ability to filter out noise like the Mullards do, and the later, map versions with their full, balanced sound, black background, and great sound staging.